I can't remember my password. How can I access my profile? We all forget our passwords from time to time. No worries. 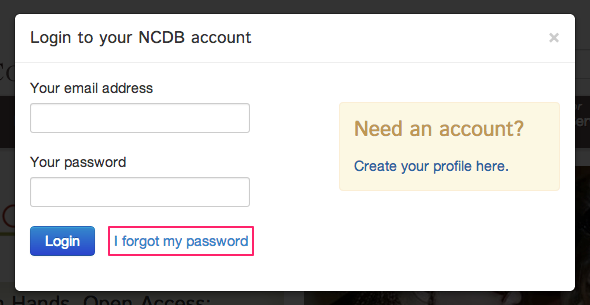 You can create a new password and get back into your NCDB profile. Step 1 Use the Login choice in the upper right hand corner of your screen and click the "I forgot my password" link in the account login window. You will then be asked to enter the email address for your profile. This is the email address you used when you set up your NCDB profile. Once you have entered your email address, click the SEND button. A randomly generated, temporary password will be emailed to you. If the email address you entered can be found in the system, you will see the green confirmation message displayed below. Step 2 Check your email. 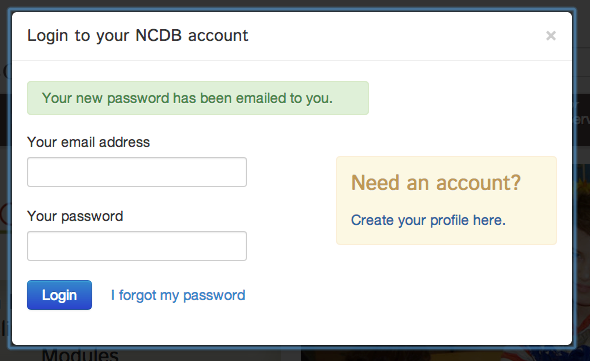 You should see an email with the subject line "NCDB Account Password Reset". Open this email and find your new password as shown below. Copy and paste this password into the login window and you should be able to access your profile once again. Once you've logged in, you can EDIT your profile to change this password to something you will remember.